Crisp pomme frites layered with shaved prime rib and Quebec’s finest cheese curds drizzled with a rich au jus. 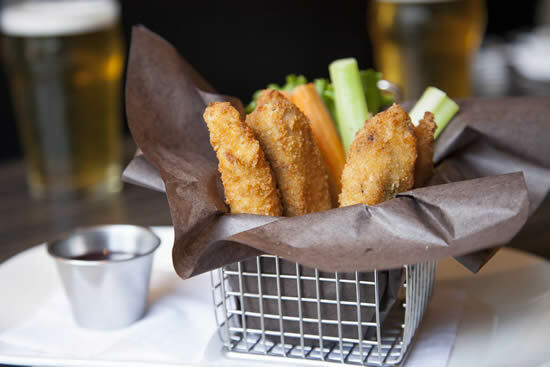 Housemade chicken fingers served with a blueberry plum sauce, carrot and celery sticks. Steamed PEI mussels with roasted tomatoes and crumbled chorizo in an Argentinian white wine broth. Finished with fresh basil and toasted home style garlic bread. 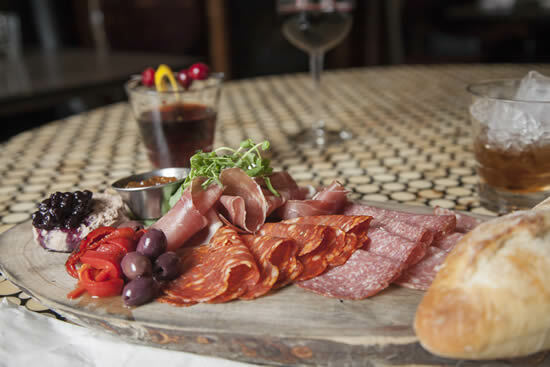 Charcuterie-Chef’s selection of Italian Proscuitto, Hungarian Salami, Genoa, and spicy Soppressata. With a fine herb veal pate’ and drizzled with a blueberry compote. Pairings include a stone ground mustard with Manzanilla Kalamata olives and fresh Artisanal bread. Nacho average dip! Piping hot layers of refried beans, a pepita chipotle mole, jalapeno cream cheese, tomatillo salsa, roasted corn and basil tomato. Topped with our melted smoked cheese blend and served with crisp seasoned corn tortillas. Finished with cool guacamole and tequila sour cream. Golden and crispy breaded cauliflower tossed in a buffalo hot sauce. Served with carrot, celery and a dill ranch dip. A baked flour tortilla roll layered with spicy black bean, cream cheese, double smoked cheddar, tomatillo salsa, avocado and spicy jalapeños. Served with salsa and sour cream. Hearts of romaine, lightly dressed with an egg free vinaigrette. 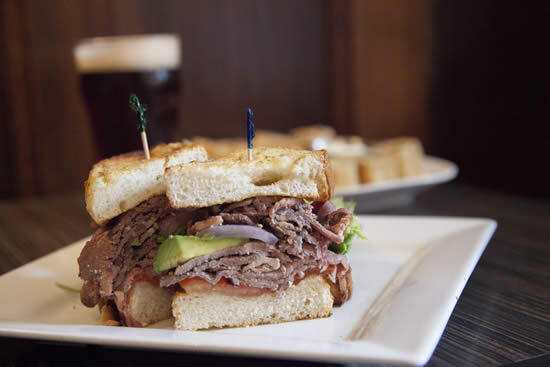 Complimented with crisp prosciutto, house made croutons and an Asiago cheese crisp. Fresh arugula prepared with a house made maple balsamic dressing, paired with Ontario prosciutto, roasted cashews, sweet figs and shaved, smoked cheddar. A medley of roasted beets, parsnips, rutabaga, carrots, red pepper and thin cut zucchini, in a roasted garlic and herb vinaigrette. Accompanied with a creamy lemon, infused ricotta cheese and toasted pepitas. Our crisp signature house greens are served with cherry tomatoes, English cucumbers, feta cheese, craisins and candied pecans. Tossed in a maple balsamic vinaigrette. A chiffonade of black kale with dried currants, toasted pepitas, Pecorino and Parmesan cheeses tossed in a citrus vinaigrette. Ask your server to add a protein. 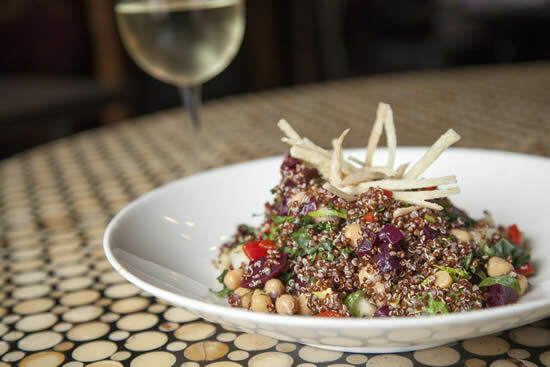 A fresh salad bowl served with a cornucopia of ingredients, including: avocado, chopped kale, warm chickpeas, beets, roasted garlic, red peppers and cucumber. 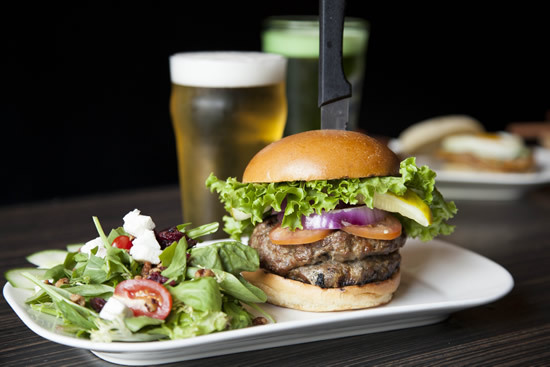 All of our signature burgers are 8 oz of Certified Canadian Angus brisket prepared in house and served on a toasted Artisan Brioche bun. Vine ripened tomatoes, lettuce, sweet red onion and dill pickle. Grilled to perfection and topped with roasted red peppers, sweet caramelized onions and goat cheese. Homestyle chickpea and root vegetable fritter, seasoned with roasted garlic, tahini, cumin and coriander. We then top it with shaved napa valley cabbage, tomato, onion and a garlic yogurt sauce. Served on a toasted brioche bun. Tender breast of chicken features “Borgos” double cream Brie, smoked bacon, lettuce and vine ripened tomatoes. Finished with pesto aioli, on a toasted ciabatta. Our famous Prime Rib shaved thin and char grilled to medium rare. layered with avocado, roasted roma tomato and blistered red onion served between home style garlic toast. Not your average BLT! Ours is generously layered with ripe juicy tomatoes, crispy bacon, cheddar cheese and our own chipotle aioli on a demi baguette. A fire grilled salmon fillet with tomato, lettuce and a lemon basil aioli. Served on home style garlic toast. Our traditional potato gnocchi is served with a light cream sauce and topped with lemon infused ricotta, sweet peas and crisp pan fried prosciutto. 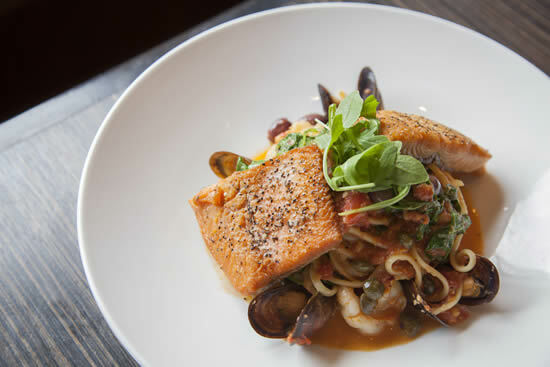 Prepared with a selection of fresh seafood including mussels, shrimp, a fillet of salmon and trout. Fragrant plum tomatoes, Kalamata olives, capers, crushed chillies, arugula and garlic complete this dish. Pan seared chicken tossed with roasted garlic, roma tomato and spinach in a lemon goat cheese sauce. Chorizo sausage with sweet roasted cherry tomatoes, cheddar, gruyere, mozzarella and parmesan. Oven baked until golden brown. Slow braised beef and roasted vegetable stew in a rich broth. Topped with a golden puff pastry shell. Maple glazed, pan seared rainbow trout garnished with balsamic pearl onions and double smoked bacon. Served over our very own seasoned root vegetable hash. 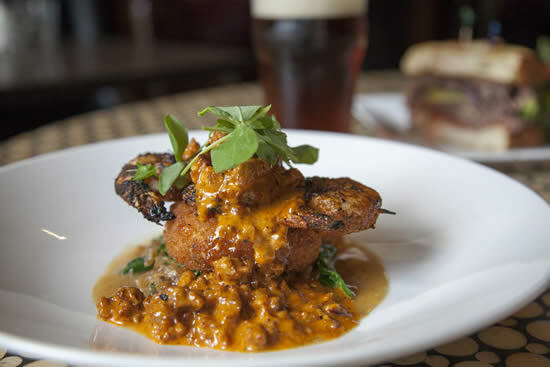 Blackened char grilled jumbo shrimp paired with a crab and lobster risotto cake and sautéed collard greens, finished with a chorizo cream sauce. Carefully pan roasted and served with a traditional curry butter sauce and brown basmati rice. Accompanied with a lightly grilled naan bread and rencon root garnish. A half chicken marinated for 24 hours in extra virgin olive oil, roasted garlic, rosemary and lemon. It is then roasted and grilled, sealing in all of the flavours. Served with roasted vegetables and dry cured olives. A marinated dry rubbed Canadian flank steak. Char grilled to perfection served with kale salad and fresh cut frites. An 6 oz AAA beef tenderloin, wrapped in prosciutto and pan seared to order. 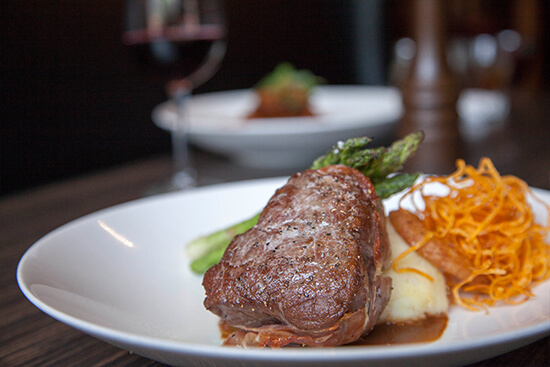 Served with a beef demi-glace, truffle mashed potatoes and char grilled asparagus.